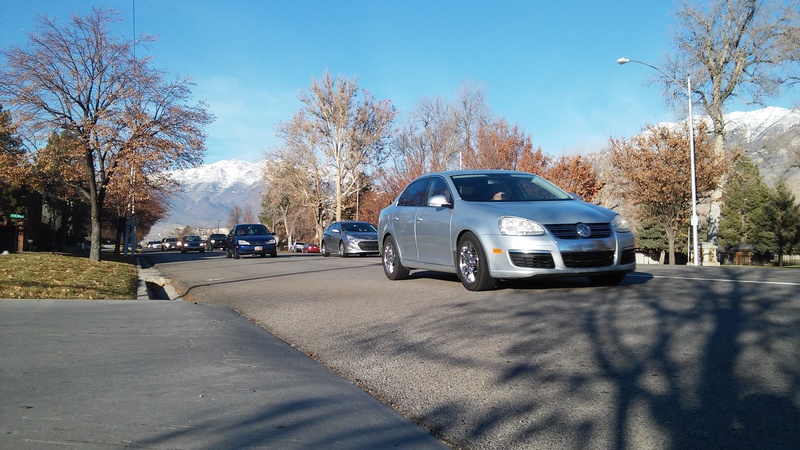 I’m exploring a site along Provo’s 500 West, which a SafetyAnalyst project identifies as one of the most crash-prone stretches of road in the county. SafetyAnalyst allows a transportation researcher to combine data and other analytical tools to identify roadway segments and nodes which are statistically more dangerous than others, controlling for many other factors. I expected to find a street in poor repair with a large number of obvious safety concerns. I found a street that, in my view, appears to be one of the safer ones I’ve seen. However, among the good, there are a few nit-picking flaws. One or more of these may contribute to the street’s collision rate. Bad: The 35 speed limit is inconsistent with a northern seven-lane segment of US-89 (500 West) which is 40-to-45 miles per hour. Perhaps drivers expect a higher speed limit and end up rear-ending slower traffic moving leisurely slow from the street’s calming features (residential, trees, low speed limit). The long gap between the University Parkway and Provo Center Street interchanges could induce drivers to travel at higher speeds to quickly access I-15. Since no other parallel route has a higher limit, this road becomes the choice for speeders (I personally speed on Freedom Blvd, but that may just be me). The grass between the sidewalk and the curb exceeds 15 feet along this entire stretch of road. Good: There must be eight-plus feet of grass between the sidewalk and the curb. There are trees, but they appear to be cut nicely and give a great line of vision in both directions for drivers exiting driveways. It reduces conflicts with pedestrians. Bad: Creates a feeling of openness which helps drivers feel more comfortable traveling at speeds above the limit. 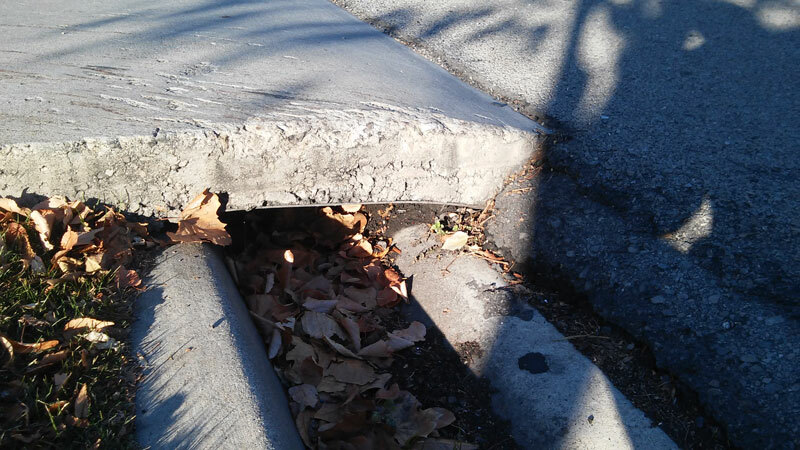 Some of the gutter is still deep ditch “Provo curb,” which distracts a driver’s attention, who may be more concerned about not falling into the gutter than she would be about the traffic. To avoid the deep gutter, drivers may turn in and out of driveways far too slowly, increasing the risk of a collision. An example of deep gutter “Provo curb” which may distract drivers exiting and entering driveways. Look at that generous distance of red curb between the on-street parking and driveways. Long gap between on-street parking and driveways. Good: The generous amount of red curbing also helps provide excellent visibility when exiting a driveway. It really surprises me there are a large number of angle collisions. Bad: The red curb reduces the overall number of on-street spaces, making each space more valuable. In turn, a motorist may be more inclined to drive riskier (sudden swerving, sudden braking, etc.) when they see an open on-street space. The only to non-signalized intersections on this segment are both T-intersections. 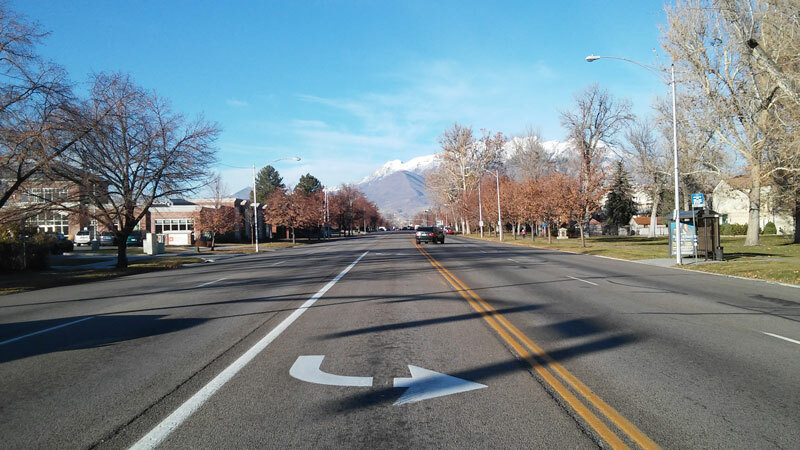 Good: I expected to find several uncontrolled four-leg intersections, which are common on Provo’s grid. There are none. There are two three-legged intersections, which have far fewer conflict points (nine instead of 32). One street Ts into an apartment complex. The other Ts into North Park. This really should be reducing angle crashes. Bad: Perhaps one (or both) of these signals warrants a signal. Perhaps the non-linear crossing causes drivers to make weave (left turn, straight a block, right turn) and engage in more conflict points than a simple signalized straight-across crossing would have. Parking lot connect to driveways. Good: Nearly all the driveways (13) are parking lots, which allow vehicles to exit facing forward. This should reduce angle crashes. Bad: Three residential driveways still require drivers to back up into traffic to exit. This could be responsible for some angle crashes. The street has no paint separating the outside travel lane from on-street parking. Good: There are no good attributes. 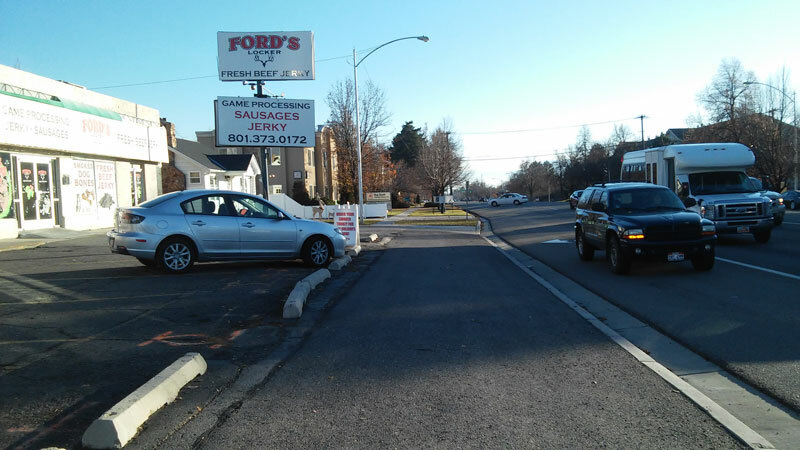 Bad: It’s unclear where the outside lane ends and the on-street parking area begins. This could be responsible for some of the collisions with parked vehicles. No center median, leaving all five lanes uncontrolled. Good: Reduces risky U-turns or wrong-way drivers who are attempting to make left turns in places where a left is not accommodated. Center turn lane separates northbound and southbound traffic which should reduce head-on collisions. Bad: While a center turn lane reduces many head-on crashes, a well-built center median may eliminate all head-on collisions. With a turn lane all driveways act as T intersections. With a median, only right in/right out is permitted, which has far fewer conflict points. Good: The extra buffer should reduce sideswipe crashes. Bad: The extra buffer may give drivers a false sense of security, making them more comfortable with distracted driving habits, which could increase the number of sideswipe crashes. Bad: A driver with poor headlights may have difficulty seeing parked vehicles, roadway obstructions, or other motorists who’ve forgotten to switch their headlights on (far too common around college towns). 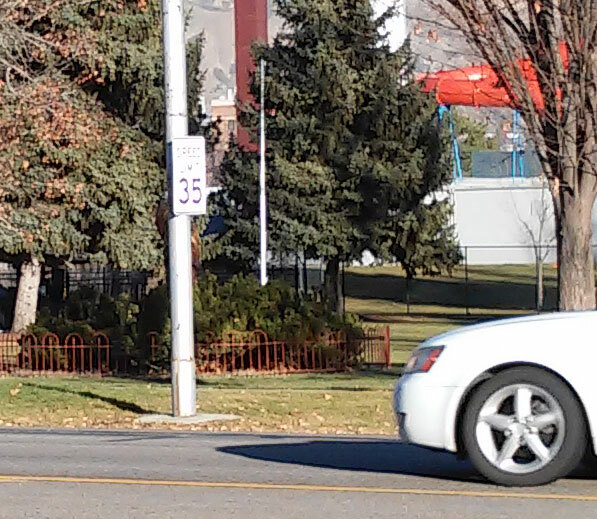 The current speed limit along this section of road is 35 miles per hour. Reasoning: The current speed limit is sending a mixed message. It’s slow enough to make many local drivers treat the road like a neighborhood. Raising the limit to 40 sends a clear message this street is an arterial for moving cars. Higher speeds are less comfortable, especially in the context of the existing street design. 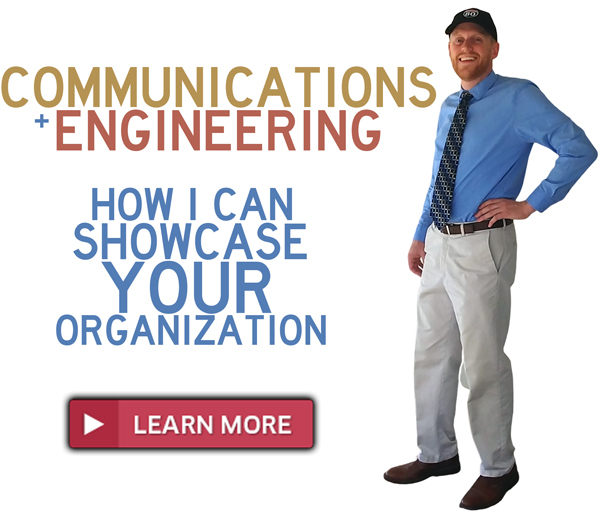 It may force drivers to pay closer attention to the traffic in front of them. This should reduce the number of rear-end collisions. In addition to the 40 limit, reducing lanes from 12 to 11 feet could also add to driver discomfort, promoting attention. Reasoning: This is such a cheap solution, I could personally pay for it (though I’m not volunteering). The white stripe sends one last reminder to an inattentive driver drifting toward a parked vehicle that he’s about to hear a loud crashing sound if he doesn’t change course. The reflective white paint may be easier to see in the dark than the reflectors on a parked car. Reasoning: I concede this needs a traffic study to determine if the benefit of reduction in conflict points from driveways outweighs the detriment of drivers engaging in risky behavior to avoid or circumvent the median. If it does, it should reduce the number of angle crashes along the street. Reasoning: If the roadway is well-lit, drivers can see obstructions better, which should reduce nighttime collisions of all categories. Honestly, the roadway doesn’t look that bad. If it hadn’t been for good, solid statistical analysis I never would have suspected this segment as being problematic. That’s a credit to the project Mr. Kelley did. My gut instinct would say the problem with this segment is less about the road and more about the type of inexperienced drivers who use it. 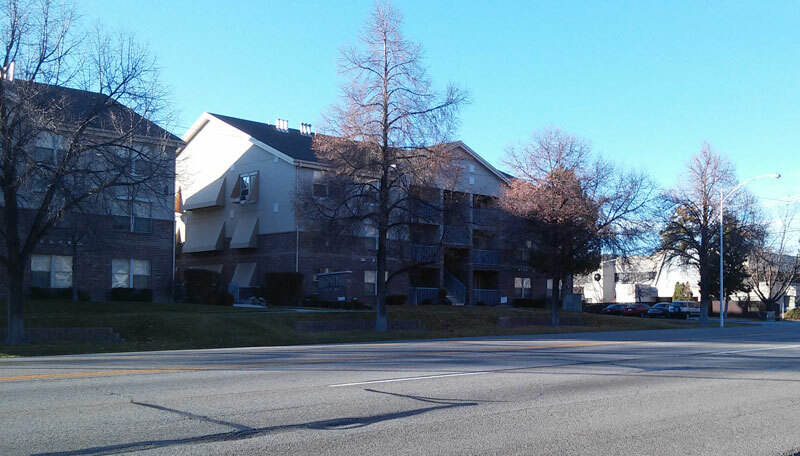 There are two large student housing complexes along that stretch of 500 West. However, if that’s true, similar roads (Freedom Blvd, University Avenue) near other student housing complexes should also be nearly as crash-prone.